When all parties involved in the construction process fully understand their roles and are able to anticipate potential points of conflict, disputes and delays will be minimised. The Employer’s and Engineer’s Guide to the FIDIC Conditions of Contract sets out the essential administrative requirements of a FIDIC based contract by reference to the FIDIC 1999 Red Book. The obligations and duties of the Employer and the Engineer are identified and discussed. Potential pitfalls are highlighted and likely consequences pointed out. The importance of the Employer’s role in the preparation of tenders, which fully reflect his requirements and duties and obligations arising in the execution of the works, is emphasised. The key role of the Engineer in the effective administration of contracts after award is examined and commentary provided. Included in the guide are a number of appendices, including model letters which will be of value to less experienced staff (particularly those whose mother-tongue is not the English language). Engineers, quantity surveyors and project managers engaged in the contractual administration of international projects using FIDIC forms of contract will find the concise guidance in simple and jargon-free language provided here invaluable. 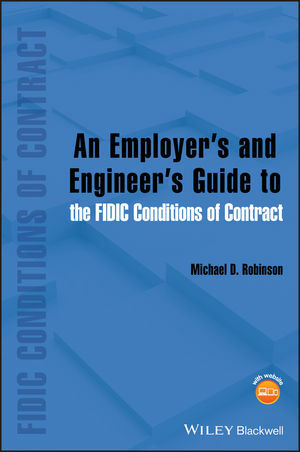 This, together with the author’s earlier book, Contractor’s Guide to the FIDIC Conditions of Contract - which describes the duties, rights and responsibilities of the Contractor – represents the totality of supervision, design and execution of construction projects executed under the FIDIC Conditions of Contract. Michael D. Robinson, Independent Consulting Engineer has 50 years of experience with contract management and contractual issues for major civil engineering projects worldwide. He has extensive experience with dispute resolution, engineers’ decisions, dispute resolution boards and he lectures on the practical on-site usage aspects of FIDIC contracts.